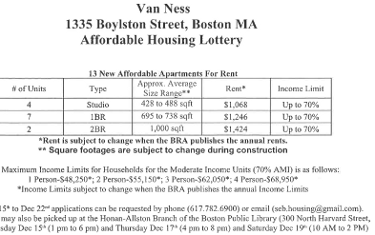 Excerpts from Fenway Park VAN NESS luxury apt rental leases. Brand new Fenway Park Luxury Apartments use this lease contract language. These are excepts of the the apartment rental lease language in rental contracts offered by most Boston luxury apartment buildings for tenants who are going to rent one. The lease for subsidized or the affordable rental units set aside may possibly be different. [ Residence: Up to 24 months of rental history may be verified on present and previous residence. A positive record ofprompt monthly payment, sufficient notice, and no damages is expected. For applicants who are homeowners, permission must be granted to verify payment history with the bank or lending institution. Credit Report: An unsatisfactory credit report can disqualify an applicant from renting an apartment at this community. An unsatisfactory credit report is one that reflects past or current bad debts, late payments or unpaid bills, liens, judgments or bankruptcies. If an applicant is rejected for poor credit history, the applicant will be given the name, address and telephone number of the credit reporting agency that provided the credit report (but not be told the content of the credit report). An applicant rejected for unsatisfactory credit is encouraged to obtain a copy of the credit report from the credit reporting agency, correct any erroneous information that may be on the report, and resubmit an application to this community. Employment/Income: Stable employment record and income verification shall be required. In order for an applicant to be approved, he/she must generally earn on a gross monthly basis a minimum of two times the gross monthly leased rent. Acceptable income verification if required may include: a paystub; a letter from the employer; the most recent W-2 form; or, for self-employed or non-employed applicants, a copy of the most recent tax return or certified verification from his/her company accountant or from a bank showing a balance sufficient to pay rent for 24 months. Criminal Background: Grounds for rejection of an applicant or occupant may include, but are not limited to, any felony conviction or arrest record. We also do not lease to applicants with certain misdemeanor arrests and convictions. Verification is through state public records. and qualifying standards. A co-signer/guarantor will be fully responsible for the Lease Agreement if the occupying resident(s) default. Prev Boston Minority Business Sales exceeded $500 million among MBEs supplying the state.